This page is kind of a downer, but friendship is nice!!! 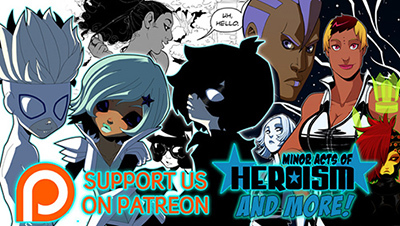 And in case you missed us saying it a dozen times, we've got a Patreon! The comic will stay right here for free, so no worries! Oh no, my heart. Children dealing with loss with EACH OTHER OH NO. Just read the whole comic in roughly two hours, and ended on a brand new page. Bonus! Sergio's parents won the lottery and are on a cruise, right? "Port Overton"...has that been mentioned before? It seems like a new hint. Now I'm wondering if there were old headlines that might point towards something––it sounds like there's been at least one disaster that's wiped out an entire city. Being careful of one another! Such sweetlings! Be careful towards one another? Uhhh, wouldn't it be easier if they told the other two about the loss they have had to go through? I mean, it's obvious all three would be understanding and accepting. Wouldn't it be a relief for them? Not to mention help them with their friendship? @Roxanne Van De Walker You're not incorrect, but keep in mind they've only know each other a few days. They'll get to that, but as it's day 3 of them knowing each other, and it's the middle of a school day where they all have to continue classes, probably none of them would be emotionally capable of handling a sudden heart to heart about their recently deceased family members with people they're only just getting to know. @interpunkt Ohhhhhhhhhh, right. I forgot that. That makes sense. Boy a lot happens in a few days.